The Crescendo®, Model 175, is the airbrush designed by professionals for professional production airbrushing. 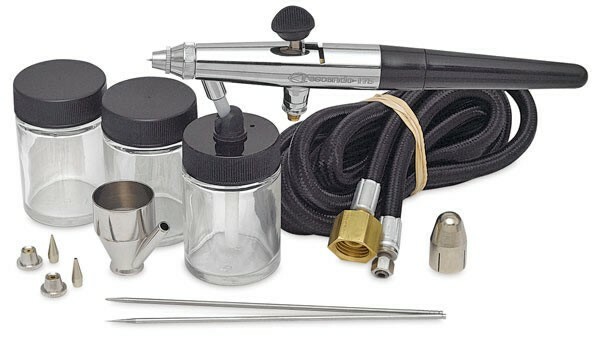 This durable, versatile airbrush works continuously with precision and efficiency. Spray regulators and tips change easily for greater flexibility on the fly. Snap-off handle allows for quick needle changes and cleaning. T-Shirt artists, fine artists, fabric designers, custom automotive painters, model painters, and taxidermists use the Crescendo®. It sprays properly reduced acrylics, enamels, lacquers, gouaches, fabric colours, inks, dyes, ceramic colours and glazes, watercolours, Air-Opaqueª, Air-Tex®, MODELflex®, Totally Tattoo® and Totally Tanª airbrush colours. This product was added to our catalog on 17/05/2011.